Back in April 2013, you wrote about how Richard Prince drew a few electric guitars and naughty bits on photos taken by photographer Patrick Cariou, and then sold them to Beyoncé, Giselle, and other really famous people for tons of money. I seem to remember that a court said that was okay, and not an infringement on Cariou's copyright, or some such idiocy. What's Prince been up to lately? So what do art critics (at least some of them) think of Prince's work? Jerry Saltz, from New York Magazine, writing on the website "Vulture" gushed, "Here he [Prince] is delving as deep as he ever has into privacy, copyright, and appropriation, twisting images so that they actually seem to undergo some sort of sick psychic-artistic transubstantiation where they no longer belong to the original makers." 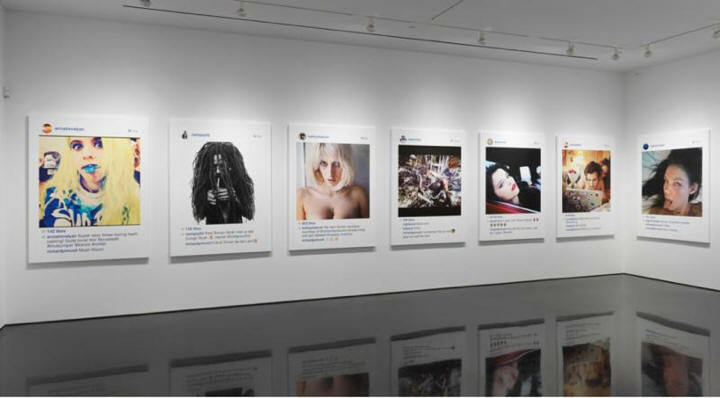 "Everyone has been asking me what I thought about famous controversial artist Richard Prince taking a series of SuicideGirls Instagram posts and printing them out and selling them at a recent gallery show at the gagosian gallery of beverly hills for $90,000 a piece. My first thought was I don't know anyone who can spend $90,000 on anything other than a house. Maybe I know a few people who can spend it on a car. As to the copyright issue? If I had a nickel for every time someone used our images without our permission in a commercial endeavour I'd be able to spend $90,000 on art." "...I'm just bummed that his art is out of reach for people like me and the people portrayed in the art he is selling. So we at SuicideGirls are going to sell the exact same prints people payed $90,000 for $90 each. I hope you love them. Beautiful Art, 99.9% off the original price... Do we have Mr. Prince's permission to sell these prints? We have the same permission from him that he had from us." According to the Copyright Office's Circular 14, "A derivative work is a work based on or derived from one or more already existing works. ... Only the owner of copyright in a work has the right to prepare, or to authorize someone else to create, an adaptation of that work. ... The unauthorized adaption of a work may constitute copyright infringement." Because nobody has yet brought a law suit against Prince over these Instagram pictures, we may never know whether his actions actually constitute copyright infringement. Past cases, like that the "Doc" wrote about in 2013 over the Cariou photos, lead us to believe that as long as people who are famous continue to pay $90,000 each for them, judges will keep looking the other way. Want to just blatantly steal someone else's copyrighted work? Don't have a hoity-toity New York art gallery that will sell the stuff for big bucks? Better check with the attorneys at LW&H first. After all, in much of the country outside the Second Circuit, copyright law still protects the little guy, and you could get in really big trouble for infringing copyright. "I find it to be shocking, disappointing, and completely unlike this historically progressive and generous company.... This is about the new artist or band that has just released their first single and will not be paid for its success. This is about the young songwriter who just got his or her first cut and thought that the royalties from that would get them out of debt. This is about the producer who works tirelessly to innovate and create, just like the innovators and creators at Apple are pioneering in their field...but will not get paid for a quarter of a year's worth of plays on his or her songs." Of course, she's saying that Apple is using other artists' copyrighted works for a three-month period without paying royalties or license fees. Apple capitulated and "voluntarily" agreed to compensate artists during the trial period. Now, it gets interesting. A photographer, Jason Shelton, caught wind of Swift's efforts and in an open letter to Swift remarked that she was a hypocrite. Shelton wrote that if Swift meant what she said about musicians then she should re-examine the way she treats photographers. In the same post, Shelton cites a copy of one of Swift's company's "Concert Photo Authorization Form" and points to paragraphs that grant Swift "free and unlimited use of our work, worldwide in perpetuity." Shelton writes, "you seem happy to restrict us to be paid once, and never being able to earn from our work ever again, while granting you the rights to exploit our work for your benefit for all eternity..." He also explained to Business Insider that concert photographers typically gets paid only if the photos are used. In response, Swift's UK representative told the Business Insider that Shelton misrepresented the contract and that it "clearly states that any photographer shooting the 1989 World Tour has the opportunity for further use of said photographs with management's approval" and that the contract did not transfer the copyrights to Swift. That's not the end of it. About a week ago, a UK - based freelance photographer, Joel Goodman, tweeted a copy of the new contract for Swift's latest 1989 World Tour. That contract restricts photographers to one use of any photograph taken at the concert and prohibits the photographer to use such photographs for any other purpose. Conversely, it grants Swift's company perpetual, worldwide rights to use the photographs. And then the kicker, it gives Swift's company the right to destroy a photographer's equipment should he or she breach the authorization! Does Shelton have a point? Are music and photographs artistic equivalents? Is Swift taking advantage of unequal bargaining power over artists just as Apple did? All good questions. We suspect that we'll hear more about this…. On June 22 the Supreme Court decided yet another patent case - this one relating to patent royalties after the patent expires. In 1964, the Supreme Court in the Brulotte case determined that even with a contract, a patent owner cannot collect royalties for making, using or selling an invention after a patent expires. The Brulotte decision has been severely criticized by lower courts and by academics. The Supreme Court revisited the subject in Kimble v Marvel on June 22, 2015. Kimble invented a Spider Man-type web slinger to shoot silly string from the palm of the hand and received a patent in 1990. Marvel copied the invention, and Kimble sued. Kimble and Marvel settled the litigation, with Marvel agreeing to pay a royalty to Kimble for as long as web slingers wanted to sling web. Marvel later learned of Brulotte and filed suit in 2010 asking to be relieved of the royalty obligation when Kimble's patent expired. The Supreme Court agreed with Marvel and refused to disturb Brulotte based on judicial inertia, known to judges and those that fawn over them as 'stare decisis.' 'Stare decisis' generally means that once a court decides a matter in one way it will continue to decide the same question the same way in future cases, unless there is a good reason to change. The majority noted that Congress had fifty years to fix Brulotte if it wanted to do so, but has not. The majority also noted that parties can draft contracts around Brulotte by having payments after a patent expires correspond to making, using or selling the invention before the patent expires. The Supreme Court dissenters view Brullote as wrong-headed judicial activism with no basis in the patent statute and dismiss the majority's argument on inaction by Congress because passing a patent law is really difficult. In short, Brulotte is still good law and patents die on their expiration dates. Brulotte and Kimble must be considered in negotiating patent license agreements.